Le Clos Peyronnet was bought by William Waterfield’s grandfather in 1912 and has remained in the family ever since. 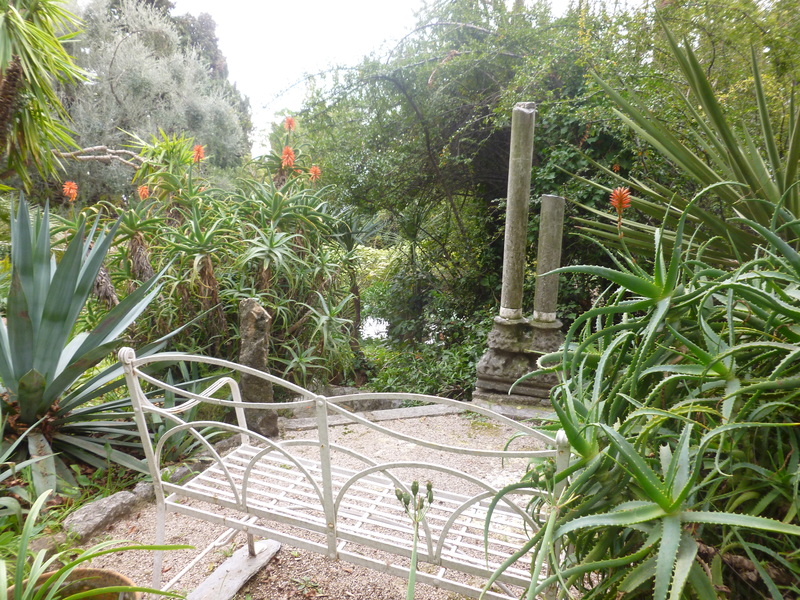 William is the last vestige of the era when British owners created exotic gardens on the Côte d’Azur. 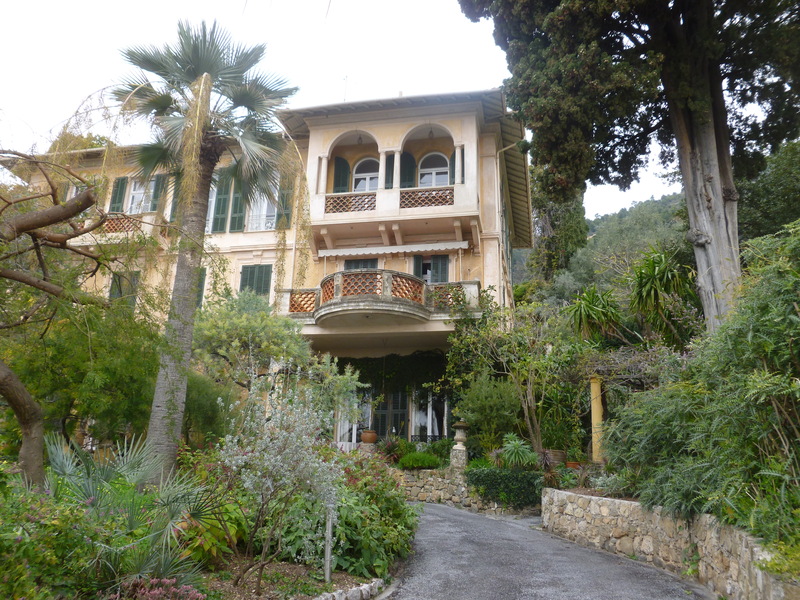 The garden and house were badly damaged by Italian troops during WWII. Returning to the house after the war, William’s uncle Humphrey Waterfield, took this opportunity to redesign rather than to restore, rethinking the layout and creating new axes throughout the garden. 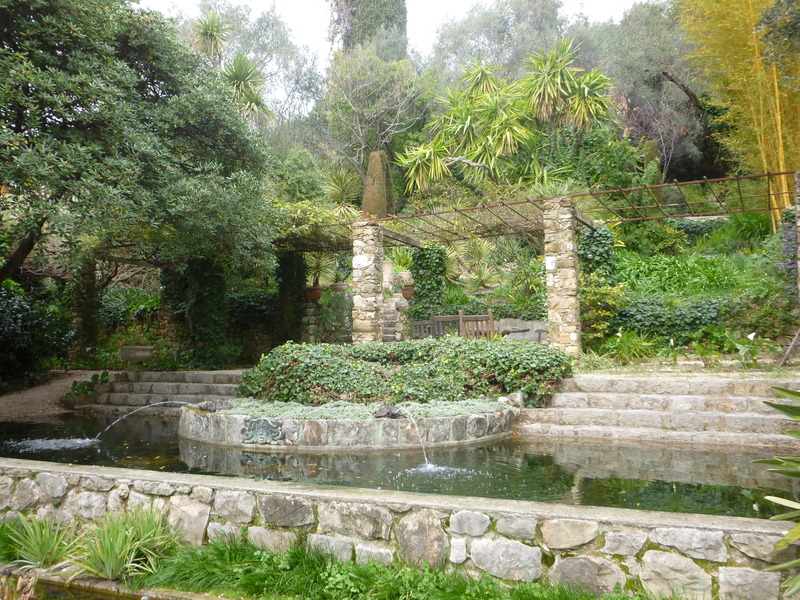 In the 1950’s and 1960’s he also added the water stairway of rectangular ponds which succeed each other down the original terraces from the top of the garden towards the blue of the Mediterranean. 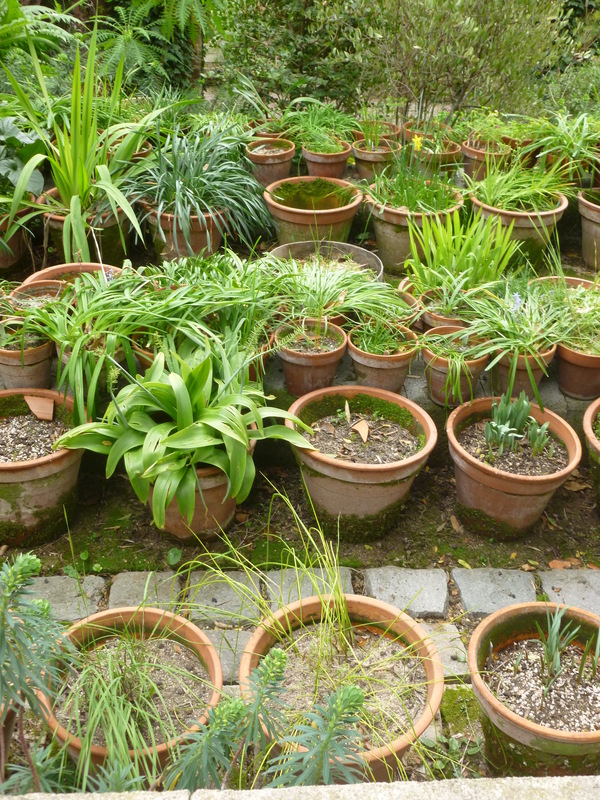 William Waterfield has lived here since 1976, not only preserving the garden, but adding many plants, especially his collection of bulbs. The day I visited the weather was cloudy but bright and the sea and sky have merged into a white-out in my photos, but I hope you can imagine the impact the views of blue sky and sea would have on a sunny day. 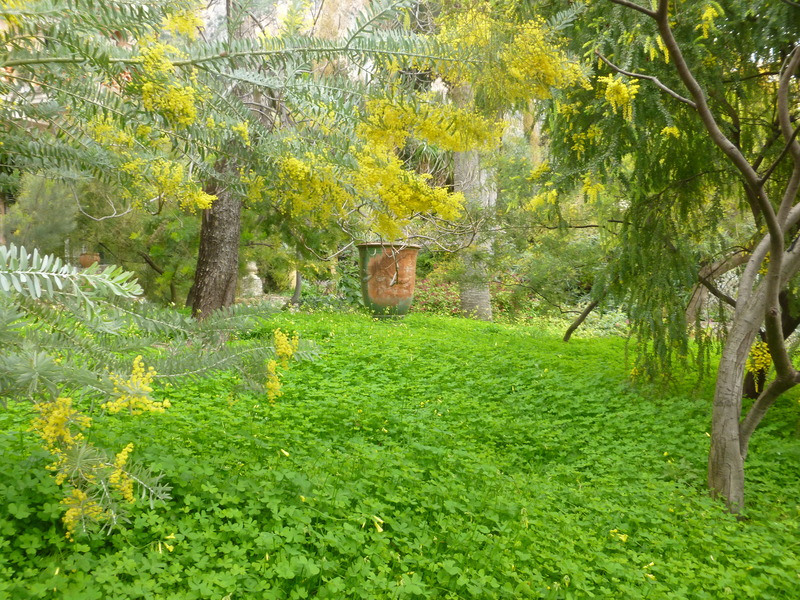 The raised island bed in the centre of the driveway is filled with mimosa trees and a ground cover of yellow-flowered Oxalis pes-caprae or Cape Sorrel. This South African plant is considered a terrible weed by gardeners here. The roots give out a toxic substance to suppress the competition, allowing it to spread rapidly and making eradication almost impossible. William has decided to stop fighting it, especially as it dies back in the summer and he and his gardener have agreed it looks pretty flowering under the mimosa. The Anduze vase was bought from nearby Serre de la Madone, which at one time sold many pots and statues to friends in order to raise money, and bears the initials of Laurence Johnston. 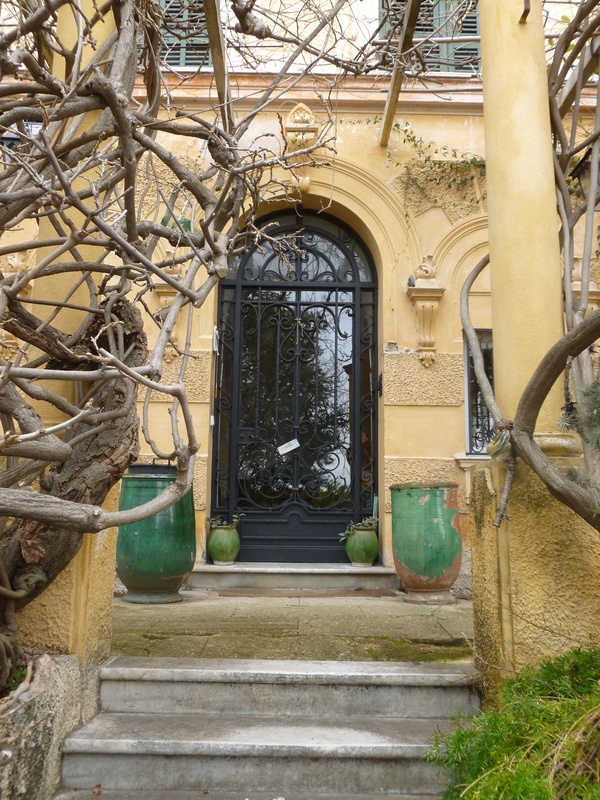 The front door is flanked by glazed ceramic vases and the huge trunks of an ancient wisteria. A pergola with ornamental columns runs the length of the house. Two Arts and Crafts style pergolas, with stone pillars, continue the axis either side of the house. These visual perspectives, designed by Humphrey Waterfield, are always finished with a strong focal point such as a palm tree, a huge agave or a large terracotta pot. 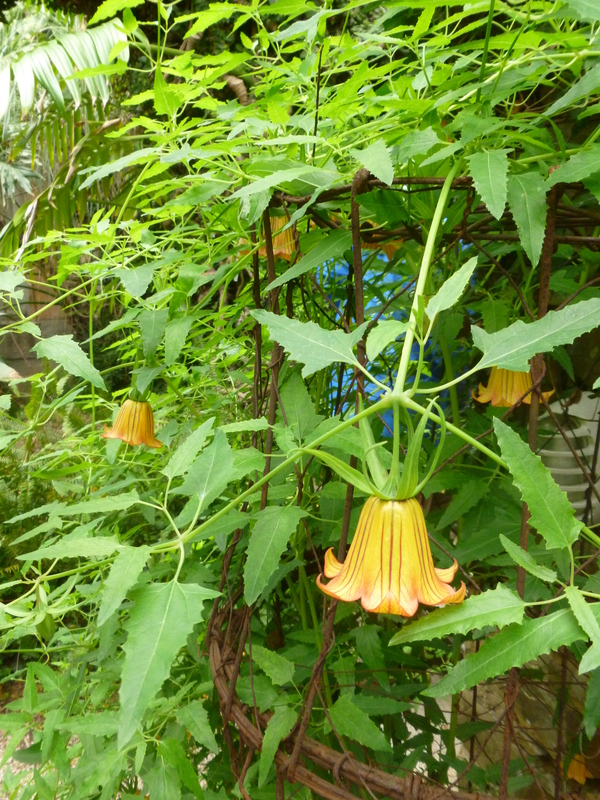 The orange veined bells of Canarina canariensis on one side of the grotto. 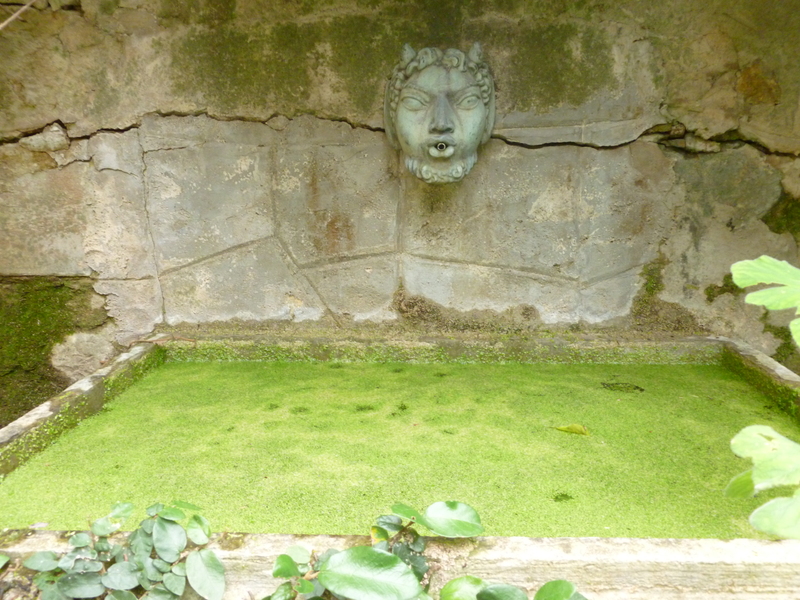 A small satyr’s head spouts water into a stone tank. 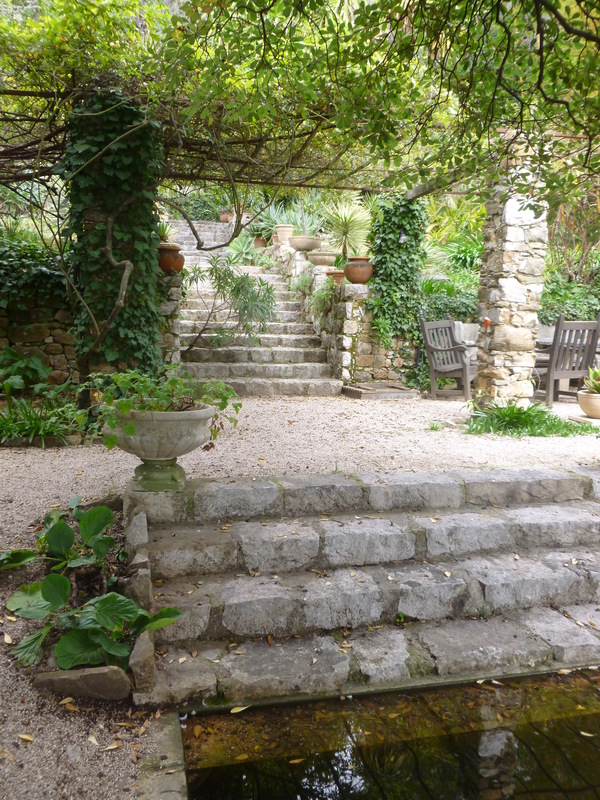 Stone steps running up to a vase create one of the vertical axes of the garden. 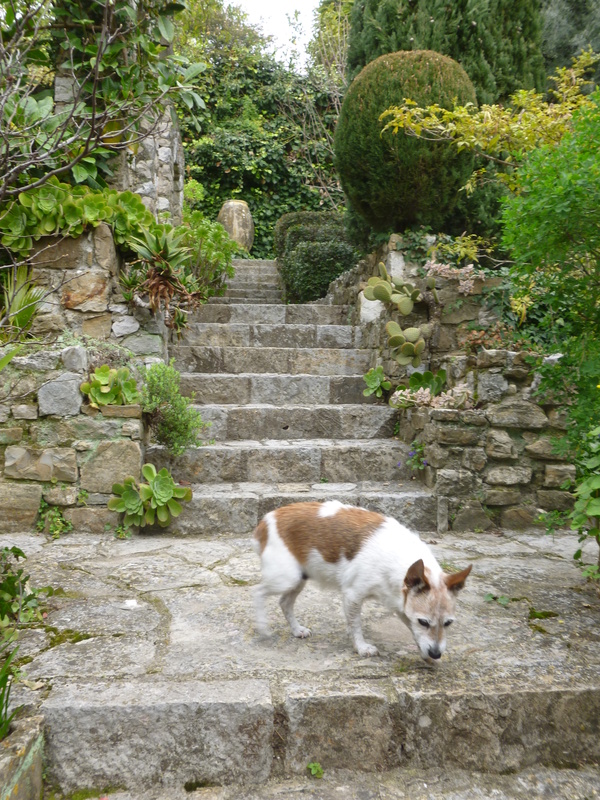 Prickle, William’s dog, gives visitors a warm welcome. He has a good name for a plantsman’s dog. 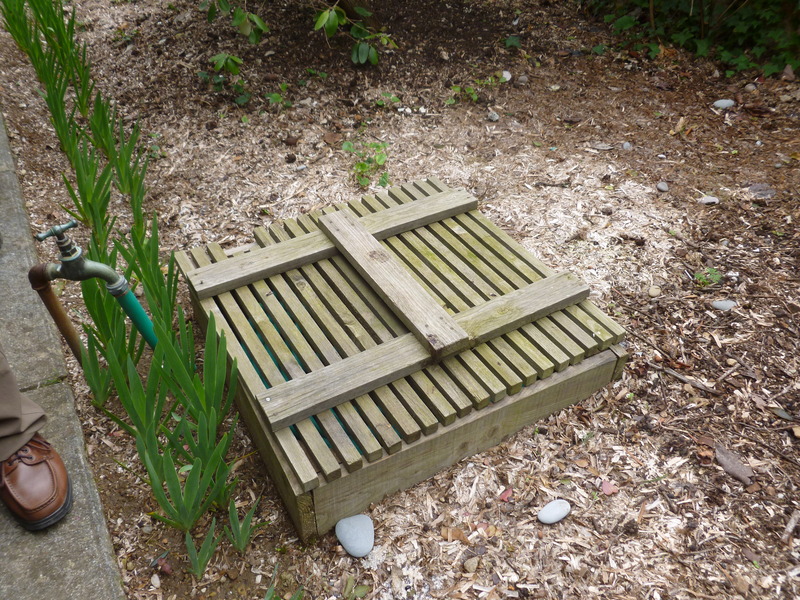 Garden hoses are hidden within these timber boxes dotted around the garden and are often well disguised by surrounding plants. 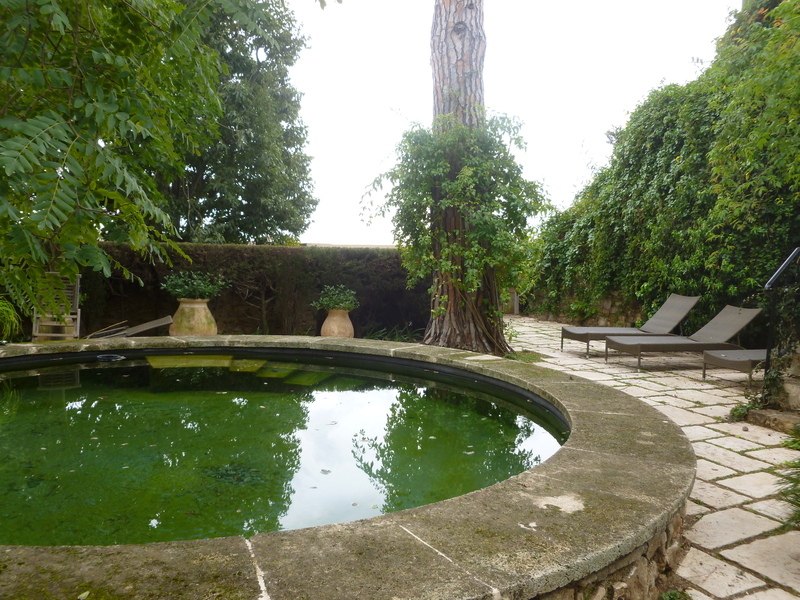 In the summer the garden takes water from a rain-water collection system built in Napoleonic times. A white metal bench surrounded by flowering aloes provides a resting spot with a view of the sea. The water stairway is a series of reflective pools that descend the terraces to the largest pool beyond the pergola. They give the impression, when viewed from above, of running down to the sea. 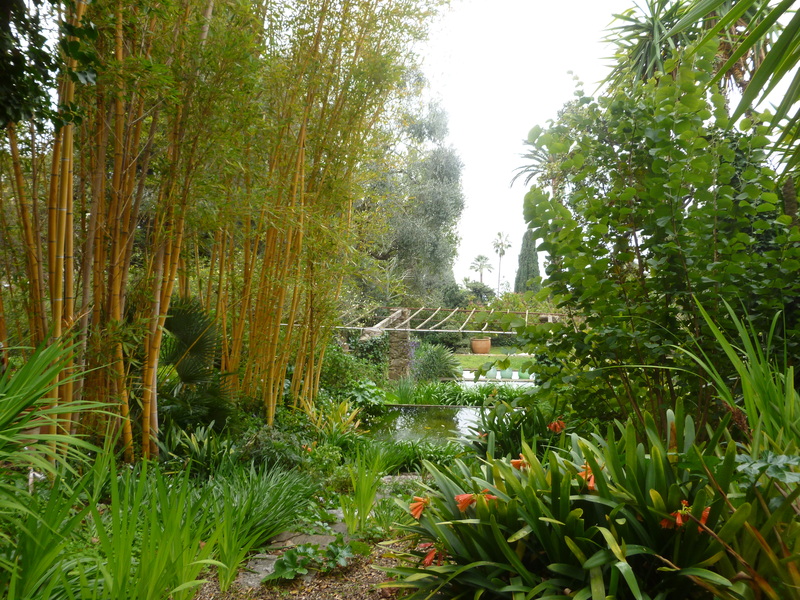 One of my favorite features of this garden are these wonderful cypress arches. In places one side has been lost, making them just leaning columns, but I think this adds to their charm and humour. When in bloom, the arching flowers of the Agave attenuata at the their feet will mimic their tall leaning forms. 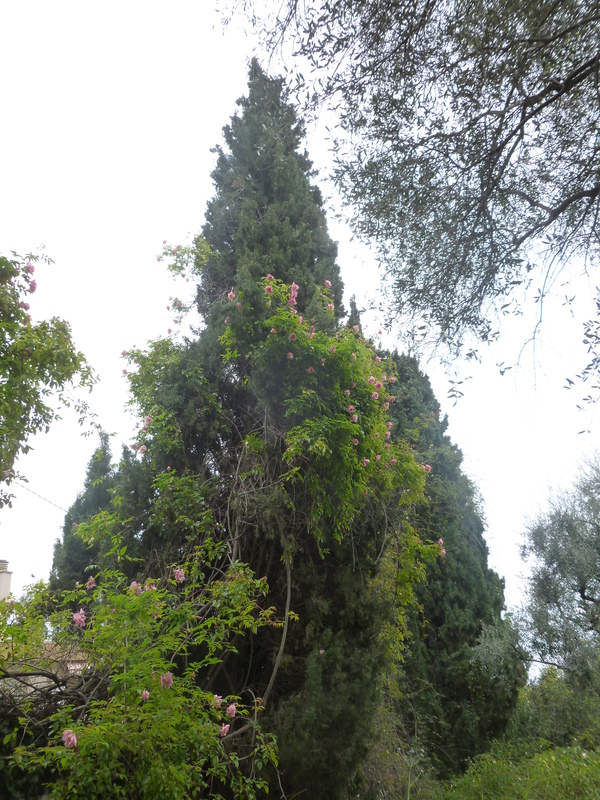 The Riviera rose, Rosa ‘Senateur Lafollette’, has scrambled high into a cedar tree, and is flowering profusely in late February/early March. William is a collector of South African bulbs, many of which he has brought back from his travels. I read that the garden hosts over 300 different species. 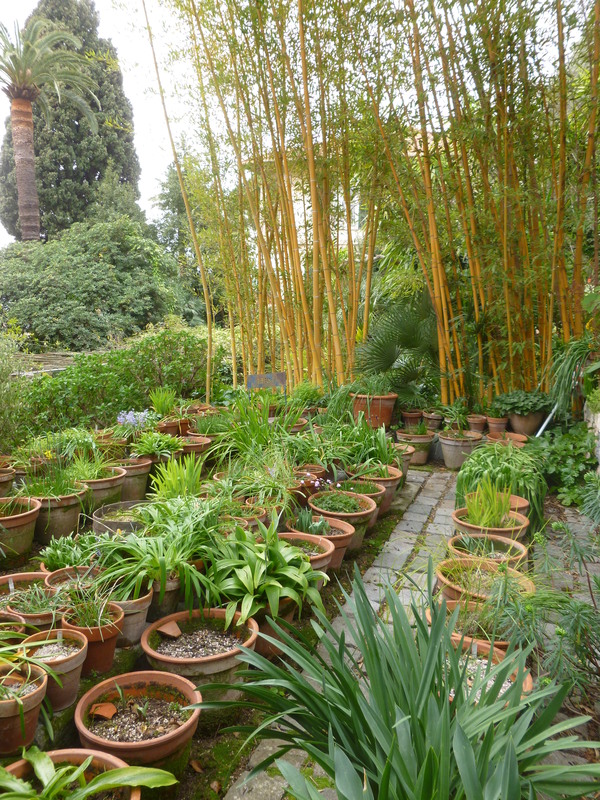 On one of the terraces, backed by a beautiful golden stemmed bamboo, his collection is laid out in terracotta pots. 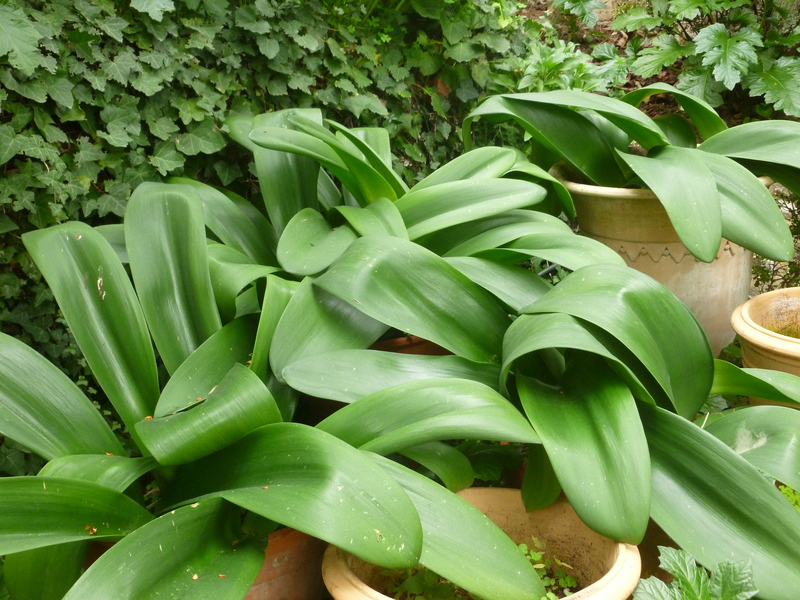 The very wide glossy leaves of this plant, in William’s collection of South African bulbs are very striking. The brilliant RHS enquiry service identified it for me as a Haemanthus, perhaps H. coccineus. 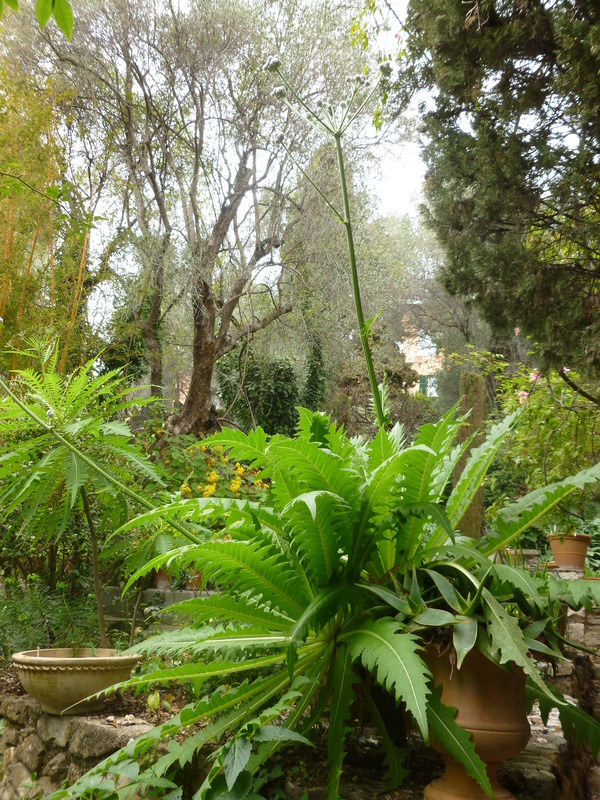 This beautiful plant, with its wonderful jagged leaves is a Sonchus sp. It’s like a monster dandelion and the leaves were such a brilliant spring green with the sun shining through them. 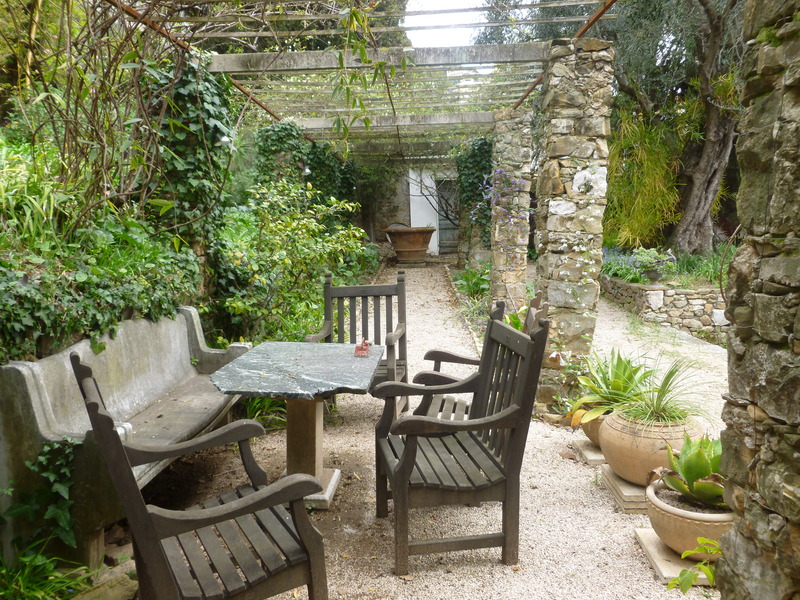 This third pergola provides a lovely spot to sit in summer. 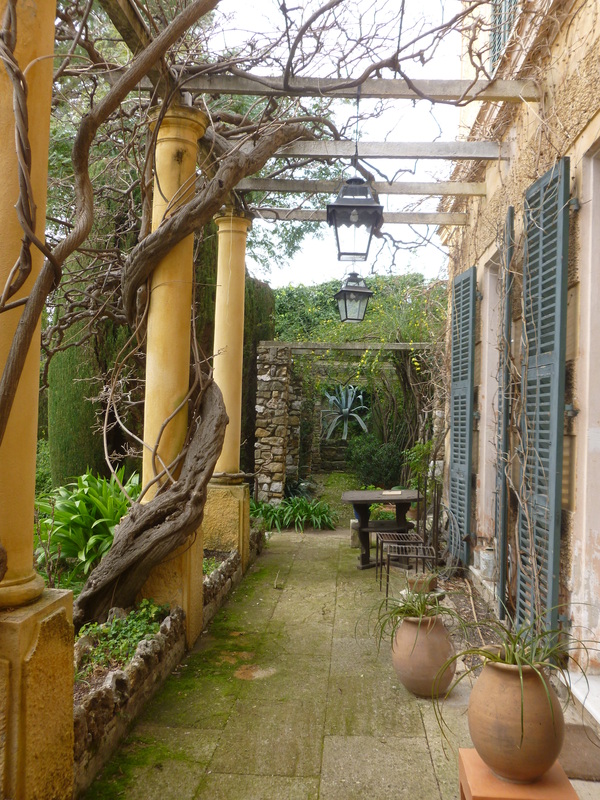 It lies the other side of the front of the house, continuing the pergolas across the entire width of the garden. 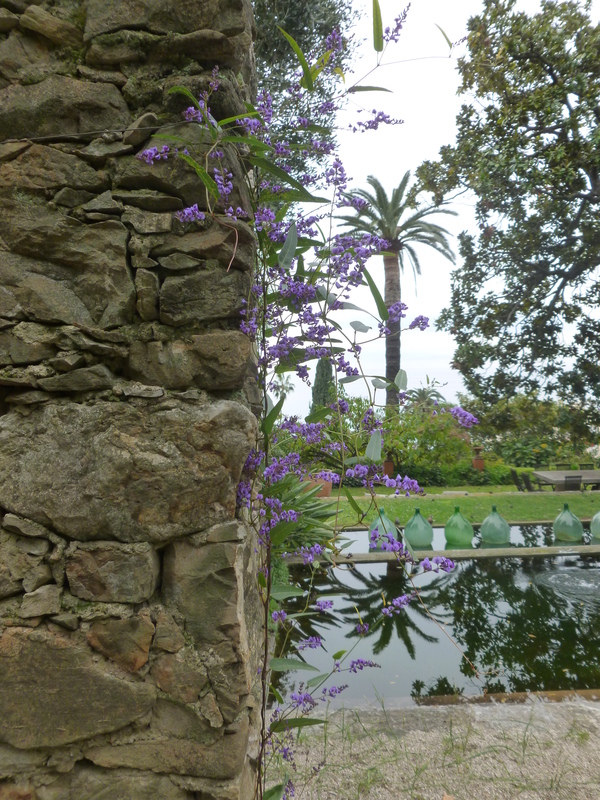 A Hardenbergia violacea, with its delicate pea-like flowers, climbs one of the stone pillars. 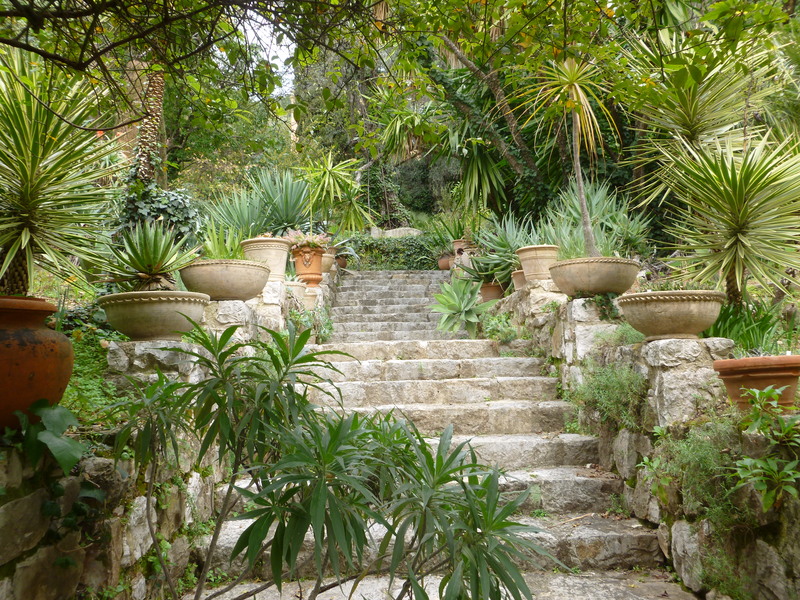 Shallow bowls and pots planted with succulents flank the stone steps. The steps continue beyond the pergola and descend into the pond. The water stairway that descends the garden terraces finishes in this larger pool with splashing terrapin fountains, goldfish and a resident pair of small ducks. This beautiful garden has been created to make the most of the old stone terraces, the tropical climate and wonderful sea views. The precise axes and visual perspectives make the most of the steep terrain, giving the garden a good structure. It also contains so many interesting and unusual trees and plants, some of which are now over 100 years old. But most of all it is a very romantic and charming garden, perhaps reflecting the characters of the three generations of Waterfields. 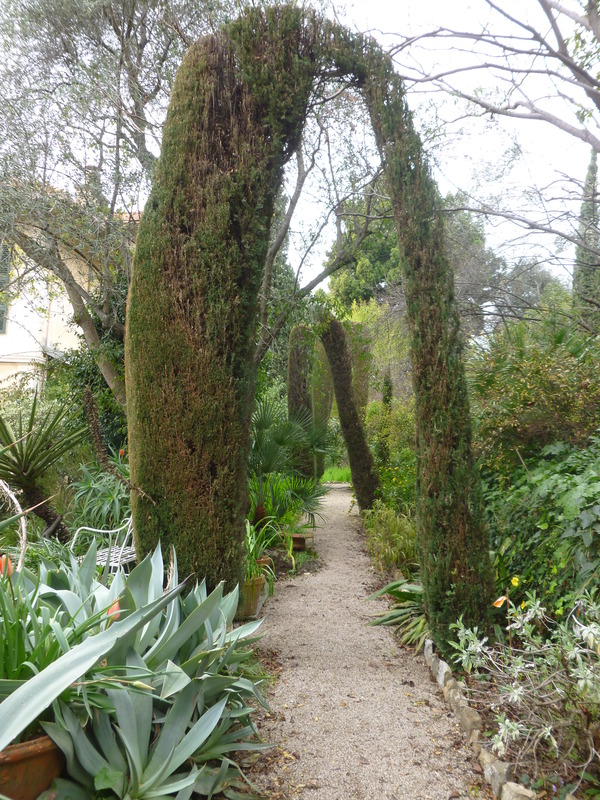 The garden is private and is not open to the public except for private tours and occasional visits organised by the Office de Tourisme in Menton. Menton is a lovely place to visit with a picturesque old town clinging to the steep hill descending down to the sea. We were there for the Lemon Festival which takes place in February-March and features huge sculptures made of citrus fruits and a carnival parade. Also interesting to visit is the new Jean Cocteau museum designed by architect Rudy Ricciotti, the cabanons of Le Corbusier and Eileen Gray on Cap Martin and of course the other beautiful gardens in the area including the Villa Val Rameh, Villa Ephrussi-Rothschild, Laurence Johnstone’s Serre de la Madone and the Hanbury gardens just over the Italian border at La Mortola. The RHS identified the bulb for me, there Advice service is brilliant. Apparently it is a Haemanthus, perhaps H. coccineus. They are similar to Clivias (which I learned recently should be pronounced Clive-eah after Clive of India) but the leaves are much wider and more lax. Will we see you at Coursons/Chantilly? Yes I’ve seen those in SA too, wonderful country! I’m afraid Chantilly clashes with Chelsea build up, I’m organising the Hardy Plant Societies display in the Gt Pavilion, hope everything goes well for you and Mick, should be interesting to see how it compares with Courson. The satyr waterspout was carved by the sculptor Hugo Powell (1919-2014) in 1951. We are staging an exhibition of his work in Oxford – you can find more details on his website at http://www.hugopowell.co.uk if you are interested. Thanks for posting about this. Looks really interesting. The Hardenbergia. Much loved in Sth Aust. Variations: Comptonia and Nigricans.